The meaning of the Three of Wands hints that you are planning or going to plan for the future with more conviction. This could mean that everything around your plans is going smoothly, as you have taken the time to plan your future, and are taking steps to turn plans into action. It hints that you are perhaps creating a stable foundation for yourself. The symbolism within the Three of Wands is that opportunities that can take place to widen your horizons in many areas. It also is a warning to keep your mind open as better opportunities could open up to you. As you take steps towards achieving what you set out to do, you are also becoming more aware of opportunities that are coming your way, and this could be take you out of your comfort zone. This pushes you to sometimes embrace change, and to start thinking in the long-term. The Three of Wands hints that you are creating a stable foundation for yourself. The Three of Wands can show that you are in control and have a strong position, just like the character that overlooks and stands strong. 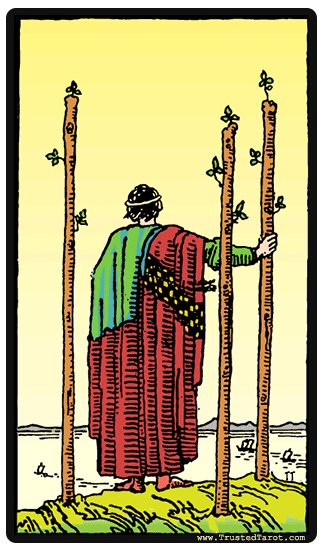 The Three of Wands is one of the main cards of foresight and vision. The last Three of Wands meaning is that of travel in search of what you are seeking. There is a sense of leaving home, a voyage that must be undertaken. Great things do not happen to those that simply wait for them, you must expand. For most readings, this shows that you may travel to a new land over the water and that you may find an opportunity during your travels. The reversed Three of Wands indicates that you may have been embarking on personal journeys or developments, but you have not received the achievements that you were hoping for. This could be due to delays or road blocks. Despite all this, the card reminds you that all of your work has not been for nothing, but rather that it has helped you with your personal strength and fortitude. The Three of Wands reversed can also mean you need to take some time to plan your future. This is especially true if you have not started on your long term goals or have become overwhelmed by the tasks that you face now, or will have to face soon. You are only reacting and not acting with thought and deliberation. However, the most common Three of Wands reversed meaning is a nudge to include planning for future changes, and to watch for better options in case that they show up. The figure on the Three of Wands knows this and always keeps his eyes open for how the future could change, and it is a worthy lesson to learn.